I just wondered if Bo, lamont's dog, will be around after Christmas. He's getting big enough to "have" for Christmas dinner. If you know what I mean and I think you do. He's enough to feed everyone including mooch's family. Want some gravy train with that? After all, lamont doesn't need to pretend that he's not a muzzie anymore. Jan 20th: Trump sworn in as president. Widespread rioting by Democrat voters. Trump blamed by MSM. Black people are killed in Chicago. Jan 21st: Obama family flies to all expenses paid vacation in Tehran. Black people are killed in Chicago. Trump blamed by MSM. Jan 22nd: National debt, unemployment and economic growth found to be far worse than predicted. Trump blamed by MSM. Black people are killed in Chicago. Jan 23rd: Obama’s Kenyan birth certificate surfaces. Black people are killed in Chicago. MSM bemoans Trump’s poor record in office. Jan 24th: First celebrity leaves for Canada – turns out to be mistaken identity. Black people are killed in Chicago. MSM blames Trump for poor race relations in USA. Jan 25th Hillary Clinton is sainted by the Vatican and becomes Saint Hillary of Hollywood. 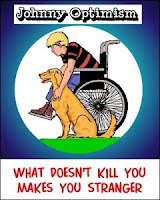 MSM offers complete coverage. Sales of ‘glow in the dark’ St Hill statues peak in Blue states. Jan 26th: Obama family given new $6bn home in Riyadh. Black people are killed in Chicago. 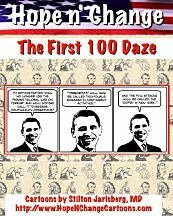 Jan 27th Obama’s college records are released. Black people are killed in Chicago. Jan 28th Clinton Foundation declared bankrupt. MSM blames Trump. Bill and Hillary buy new $8bn home near Moscow. 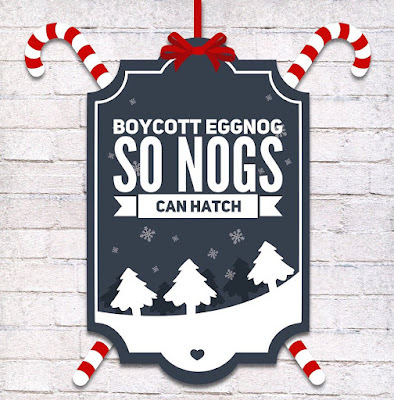 Not a chance that PETA will ever stop a favorite Southern Christmas breakfast: Soft boiled Nogs. and Hillary Rodham Clinton will never be president! Bwahahahahahahaha! Electoral College votes today. A job well-done. Will we have exit polling and winner projections, or must we wait until Jan 6th? If only Øbonzo would increase his vacation to 4 weeks instead of just 2. That would still give him a couple of days to pack and get the hell out of our White House. Yep, them Nogs are a crisis. And regarding the countdown clock on the H&C main page, if you right click on it and click 'open in new tab' it will be in its own tab ready to look at 1,822 times a day. @Bobo- Chelsea is waiting in the wings, and from what I hear she is every bit as qualified for high public office as her lovely mother. Tricky Ricky, besides that, Chelsea is just as likeable. Remember when, just prior to his re-election, obviously thinking rubbing up to the Russia ns would help his "world image" for re-election, Obama whispered to Russian President Medvedev, "Tell Vladimir I can be more flexible after I'm re-elected"? Medvedev leaned forward, put his hand on Obama's knee, and whispered back, "I will tell Vladimir." Whispered. A secret message, and a powerful, collusive one. Not realizing that nearby microphone was on. It was just meant for Medvedev and Putin's ears. No American was ever to know about it. WHEN HAS THAT EVER HAPPENED BEFORE? WHY WOULD THAT EVER HAPPEN? Remember what happened after he was re-elected...Crimea, Ukraine, Syria, Aleppo, The Baltics, Kaliningrad, and more. As far as I know, nobody has ever asked Obama what he meant by that...asked him to explain it. To explain that degree of covert complicity personally with the two Russian leaders. To think that the implications of that secret message were anything other than a green light....not one agreed to with his State Department and delivered through proper channels, but clandestinely, singularly, Manchurian President to Russian President in total secrecy. But the microphone was on. And so far he has skated free. Leading to the slaughter of our Syrian rebel allies, the slaughter of hundreds of thousands of Syrian civilians, the overrun of Europe by refugees, the world-spread of radical Islamic terrorists. There has never been a better time than right now, with the false-story BS about Russian support for Trump ( in the real world, their worst nightmare ), to question Obama and thoroughly investigate the secret understanding Obama accidently revealed to all of us in actual full reality with Medvedev / Putin. Tragically, she lumped it, much as poor Amy Carter. OTOH, regar4dless of who her dad may / not be, there's NO doubt she's Hillary's daughter. ...a requirement to register Democrat at the DMV when you get or renew your car registration or driver's license so as to escape being classified as "unmutual" and investigated by AG Kamela Harris. The crystal ball fails to say if they will have coloring books, hot cocoa, and petting puppies in the new CA political re-education camps--? Interesting that the left is now directing its rage exclusively at the Russians instead of Assange & WikiLeaks. I sense a conflict in the force; the left was in love with Assange & WikiLeaks when it mainly meant leaks embarrassing to Bush. Michelle Obama: "Americans will miss having a grown-up in the White House" she says. Actually, we have for quite some time now. She also laments "loss of hope" Americans feel. Hon, it's that loss of hope you spent 8 years engendering that elected Trump. I honestly think that the Obamas are going to be shocked as to how much America is going to forget about them by February. Sure, they and their sycophants in the media will continue to make fake news, but nobody, even amongst their former supporters will really care. You think you know cold? : The better part of the last week was spent below zero at the Econ home. I attempted to go skiing last weekend, and riding the ski lift up, my anemometer recorded the wind chill at 41.5 below zero. Good luck with the pipes. We got lucky a few years ago when an unexpected air leak from a superfluous (yet required by code) intake vent for a water heater to the outside funneled a steady breeze of sub-zero air to the junction of our plumbing, which killed water to the whole house. Fortunately, nothing broke. It's bad enough paying for Obama's umteenth Hawaiian vacation, but for your plumber as well? ObamaCare: So if you now have 8 policies, does that mean that the coverage doesn't start until you've hit 8 times the deductible? Brilliant ploy on the behalf of ObamaCare! Hey, Stilt: Consider yourself lucky!!!! Just think how cold it would be if we didn't have global warming? Some real knee slappers today, fine Doctor! So, the Obama's are off to Hawaii AGAIN spending millions of our dollars AGAIN. Have at it, I say. It's a small price to pay to get them out of our property for a while. And thank GOD it won't be long until they are out for good!! Amen and Halleluiah! I'm seriously looking forward to the day I drink for enjoyment rather than memory loss. 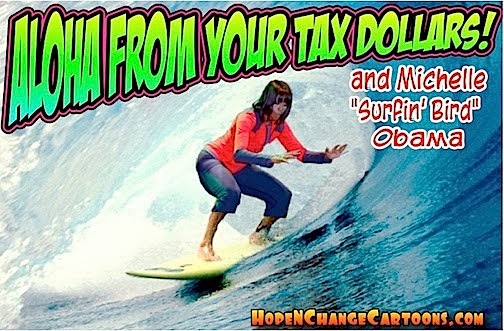 Question: Is that thing Michelle's riding a surfboard or a serfboard? Sorry about the pipes, but hey... you are REALLY covered as far a health insurance goes! Well, you're covered in paper anyway. Actual coverage is likely a different story. Here's hoping that, when your pipes thaw, the water will come out where it's supposed to come out. If I was a betting man, I'd lay some serious cash on your crystal ball. I think it is a bit inaccurate on January 25th and 28th, though. Black people will be killed in Chicago on those days, too. I loved what Judge Jeanine said about Michelle Obama's self righteous BS. "Since when did 'hope' rise and fall with you?" Good one! Actually, Mooch sort of hit the nail on the head. Hope does rise and fall with the Obama's comings and goings, just not in the direction they envision. I just read part of Øbammy's interview on NPR where he said that after leaving office(gawd I look forward to that day)he wants to take his fambily on a well-earned vacation. WTF? Isn't that what he has been doing for the last eight frigging years?? I also read where he says America is going to get browner. I can only imagine he means that America is going to have to continue to put up with the un-castrated male bovine excrement that he and the rest of his ilk have been shoveling. A run of the mill WELDING OUTFIT, clipped onto your frozen pipe at either end will thaw out the pipe in a short time. Extend the electrodes with auto jumper cables. Seems questionable, but it is commonly done by those that know the trick. Works great, and fast too. Payback for acres of very good cartoons and commentary. If anyone DOES want to comprehend "Mele Kalikimaka, here's the tutorial. Enjoy. Ok, we can all finally take a sigh of relief for a while. Trump got at least 304, and Shrillary is officially NOT OUR NEXT PRESIDENT! Who knows what Trump will be like, but we are at least spared what would surely be total economic, social, and foreign disaster. Two nights of 11 degree temps here in Far North rural Texas (up near OK) has given us 3, yes 3 water outages. Heater in pump house does not like to work in cold weather, and No6, a young hound, positively detest faucet covers in cold weather. The other 5 doggies could care less but secretly I think they egg him on. And speaking of not to bright we heard an extremely large whining noise coming from over 150 miles away toward dallas this afternoon, which despite the frosty weather warmed my heart. I suspect that drowned out the weeping, wailing and nashing of teeth from austin. President Trump, say it with me now President Trump. I HOPE you have a better new year. Speaking of HOPE and FLOTUS's bemoaning it's loss, I HOPE I never have to see or hear either her or her so-called husband again. There's so much HOPE for this country now that they'll be out of our house in DC. The schadenfreude actually keeps getting better. After all of the angst and efforts from the left to intimidate electors into defecting from Trump, it was Hillary who suffered most of the defections. The left remains in denial mode. The celebrity crowd who unwittingly created more votes for Trump than Hillary in the general election doubled down and actually created less votes for Hillary in the Electoral College. In his video plead, Martin Sheen referred to a female Elector as a male. How in the h*ll did you get temp. readings from your anemometer? An anemometer is for measuring wind speed- not temperature. Judt wondered how that was possible? None of which stopped Healthcare.gov from sending me daily reminders that I was not insured and needed to hurry to beat the cutoff deadline. No kidding. I have enough paper from those bozos to insulate the house. Обама and his buddies squeezing in a few holes alright...at the local Bathhouse!